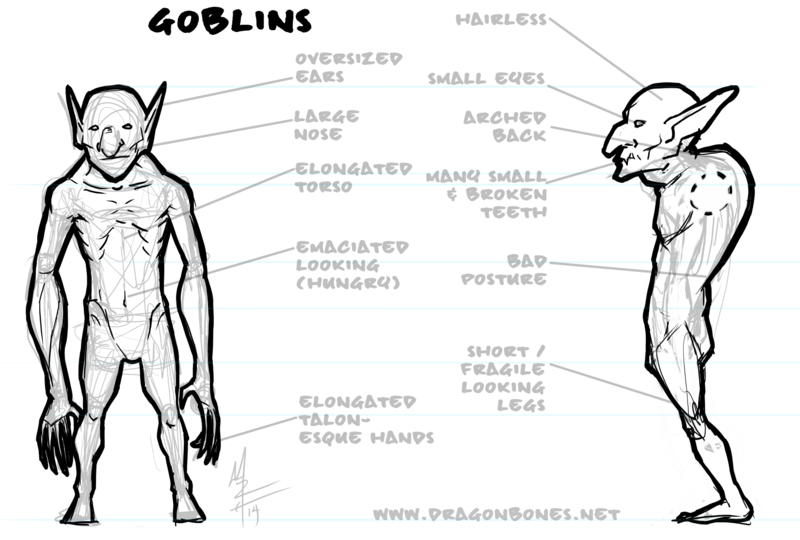 I’ve been doing some thinking about the goblins in the card game we’re developing. We’ve already seen at least one example, but I wanted to refine the idea behind the critters a bit more. There have been a lot of games who make goblins cute or funny looking lately, and that’s just really not the direction I was thinking we should take our little devils. That, by the way, is exactly where I was thinking we should take them – the concept of ‘little devils’. They’re a hoard of tiny, nearly mindless critters that overwhelm their enemies with sheer numbers. They’re not clever. They’re not brawny. Quick and razor toothed, they just… surge. So keeping that thought going, I thought: What physical attributes will make that work even better. How can I change their anatomy to create that sort of visceral mental reaction in the mind’s eye of those playing the game? This is the concept sheet that I doodled up with that in mind while I was at the steakhouse. Oversized Ears / Large Nose / Small Eyes – These things don’t even see the world in the same way you or I do. They rely on senses that are better than ours (hearing/smell) and almost ignore their sight. They live, work, and kill in the dark. Many Small / Broken Teeth – Again – these aren’t humans. In fact, my intent is to keep their teeth pointed throughout, designating them as carnivores. Creepy little dudes just got a little more creepy. Bad Posture / Elongated Torso and Forearms – The idea of how they move seemed important to me. I wanted them to move in an entirely different way than we do while still being bipedal. This led me to think about the Landstriders developed by the Frouds for the movie the Dark Crystal. Remember them? Elongated Talon-esque Hands – Remember how they don’t see well? That means they will spend a lot of time with their hands stretched out in front of them. Which, of course, means that they can’t very well be soft, sweet, gentle hands now can they? In the end, I feel like the design leaves us with a small, grotesque little creature that spends most of its time leaning forward – searching – scavenging – stalking for more. More meat, more treasure, more… mine. If you’re curious, I’ve added a sheet for how I draw female goblins for the Relics game as well. What do you think? Is there something you would change? A design element that I missed? Someplace I didn’t go far enough? I’d love to hear about it – just let me know in the comments below! Tagged art, concept art, fantasy art, figure drawing, goblins, illustration, relics. Bookmark the permalink.